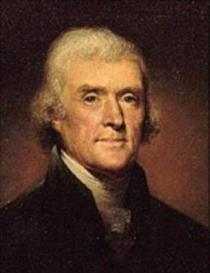 A Summary View of the Rights of British America was written by Thomas Jefferson for the Virginia Convention's delegates to the First Continental Congress in 1774. It eloquently enumerates the abuses suffered by the American colonists at the hand of King George III and the British Parliament. 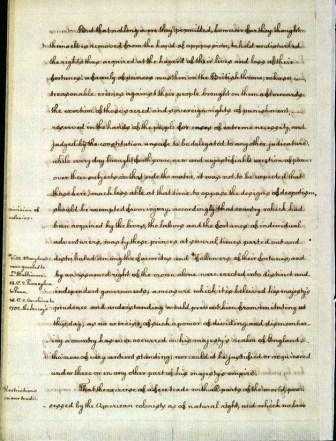 This document was read by many members of the Continental Congress over the next year and a half. When the Second Continental Congress met in 1776 and decided to declare their independence from Great Britain, they asked Thomas Jefferson to write it, partly because of the eloquent way he states his opinions in A Summary View of the Rights of British America. The Declaration of Independence was the result. Accordingly that country, which had been acquired by the lives, the labours, and the fortunes, of individual adventurers, was by these princes, at several times, parted out and distributed among the favourites and followers of their fortunes, and, by an assumed right of the crown alone, were erected into distinct and independent governments; a measure which it is believed his majesty's prudence and understanding would prevent him from imitating at this day, as no exercise of such a power, of dividing and dismembering a country, has ever occurred in his majesty's realm of England, though now of very antient standing; nor could it be justified or acquiesced under there, or in any other part of his majesty's empire. That the exercise of a free trade with all parts of the world, possessed by the American colonists, as of natural right, and which no law of their own had taken away or abridged, was next the object of unjust encroachment. Some of the colonies having thought proper to continue the administration of their government in the name and under the authority of his majesty king Charles the first, whom, notwithstanding his late deposition by the commonwealth of England, they continued in the sovereignty of their state; the parliament for the commonwealth took the same in high offence, and assumed upon themselves the power of prohibiting their trade with all other parts of the world, except the island of Great Britain. This arbitrary act, however, they soon recalled, and by solemn treaty, entered into on the 12th day of March, 1651, between the said commonwealth by their commissioners, and the colony of Virginia by their house of burgesses, it was expressly stipulated, by the 8th article of the said treaty, that they should have "free trade as the people of England do enjoy to all places and with all nations, according to the laws of that commonwealth." But that, upon the restoration of his majesty king Charles the second, their rights of free commerce fell once more a victim to arbitrary power; and by several acts of his reign, as well as of some of his successors, the trade of the colonies was laid under such restrictions, as shew what hopes they might form from the justice of a British parliament, were its uncontrouled power admitted over these states. History has informed us that bodies of men, as well as individuals, are susceptible of the spirit of tyranny. A view of these acts of parliament for regulation, as it has been affectedly called, of the American trade, if all other evidence were removed out of the case, would undeniably evince the truth of this observation. Besides the duties they impose on our articles of export and import, they prohibit our going to any markets northward of Cape Finesterre, in the kingdom of Spain, for the sale of commodities which Great Britain will not take from us, and for the purchase of others, with which she cannot supply us, and that for no other than the arbitrary purposes of purchasing for themselves, by a sacrifice of our rights and interests, certain privileges in their commerce with an allied state, who in confidence that their exclusive trade with America will be continued, while the principles and power of the British parliament be the same, have indulged themselves in every exorbitance which their avarice could dictate, or our necessities extort; have raised their commodities, called for in America, to the double and treble of what they sold for before such exclusive privileges were given them, and of what better commodities of the same kind would cost us elsewhere, and at the same time give us much less for what we carry thither than might be had at more convenient ports. That these acts prohibit us from carrying in quest of other purchasers the surplus of our tobaccoes remaining after the consumption of Great Britain is supplied; so that we must leave them with the British merchant for whatever he will please to allow us, to be by him reshipped to foreign markets, where he will reap the benefits of making sale of them for full value. That to heighten still the idea of parliamentary justice, and to shew with what moderation they are like to exercise power, where themselves are to feel no part of its weight, we take leave to mention to his majesty certain other acts of British parliament, by which they would prohibit us from manufacturing for our own use the articles we raise on our own lands with our own labour. By an act passed in the 5th Year of the reign of his late majesty king George the second, an American subject is forbidden to make a hat for himself of the fur which he has taken perhaps on his own soil; an instance of despotism to which no parallel can be produced in the most arbitrary ages of British history. By one other act, passed in the 23d year of the same reign, the iron which we make we are forbidden to manufacture, and heavy as that article is, and necessary in every branch of husbandry, besides commission and insurance, we are to pay freight for it to Great Britain, and freight for it back again, for the purpose of supporting not men, but machines, in the island of Great Britain. In the same spirit of equal and impartial legislation is to be viewed the act of parliament, passed in the 5th year of the same reign, by which American lands are made subject to the demands of British creditors, while their own lands were still continued unanswerable for their debts; from which one of these conclusions must necessarily follow, either that justice is not the same in America as in Britain, or else that the British parliament pay less regard to it here than there. But that we do not point out to his majesty the injustice of these acts, with intent to rest on that principle the cause of their nullity; but to shew that experience confirms the propriety of those political principles which exempt us from the jurisdiction of the British parliament. The true ground on which we declare these acts void is, that the British parliament has no right to exercise authority over us. That thus have we hastened through the reigns which preceded his majesty's, during which the violations of our right were less alarming, because repeated at more distant intervals than that rapid and bold succession of injuries which is likely to distinguish the present from all other periods of American story. Scarcely have our minds been able to emerge from the astonishment into which one stroke of parliamentary thunder has involved us, before another more heavy, and more alarming, is fallen on us. Single acts of tyranny may be ascribed to the accidental opinion of a day; but a series of oppressions, begun at a distinguished period, and pursued unalterably through every change of ministers, too plainly prove a deliberate and systematical plan of reducing us to slavery. That the act passed in the 4th year of his majesty's reign, intitled "An act for granting certain duties in the British colonies and plantations in America, &c."
One other act, passed in the 5th year of his reign, intitled "An act for granting and applying certain stamp duties and other duties in the British colonies and plantations in America, &c."
One other act, passed in the 6th year of his reign, intitled "An act for the better securing the dependency of his majesty's dominions in America upon the crown and parliament of Great Britain;" and one other act, passed in the 7th year of his reign, intitled "An act for granting duties on paper, tea, &c." form that connected chain of parliamentary usurpation, which has already been the subject of frequent applications to his majesty, and the houses of lords and commons of Great Britain; and no answers having yet been condescended to any of these, we shall not trouble his majesty with a repetition of the matters they contained. But that one other act, passed in the same 7th year of the reign, having been a peculiar attempt, must ever require peculiar mention; it is intitled "An act for suspending the legislature of New York." One free and independent legislature hereby takes upon itself to suspend the powers of another, free and independent as itself; thus exhibiting a phoenomenon unknown in nature, the creator and creature of its own power. Not only the principles of common sense, but the common feelings of human nature, must be surrendered up before his majesty's subjects here can be persuaded to believe that they hold their political existence at the will of a British parliament. Shall these governments be dissolved, their property annihilated, and their people reduced to a state of nature, at the imperious breath of a body of men, whom they never saw, in whom they never confided, and over whom they have no powers of punishment or removal, let their crimes against the American public be ever so great? Can any one reason be assigned why 160,000 electors in the island of Great Britain should give law to four millions in the states of America, every individual of whom is equal to every individual of them, in virtue, in understanding, and in bodily strength? Were this to be admitted, instead of being a free people, as we have hitherto supposed, and mean to continue ourselves, we should suddenly be found the slaves, not of one, but of 160,000 tyrants, distinguished too from all others by this singular circumstance, that they are removed from the reach of fear, the only restraining motive which may hold the hand of a tyrant. That by "an act to discontinue in such manner and for such time as are therein mentioned the landing and discharging, lading or shipping, of goods, wares, and merchandize, at the town and within the harbour of Boston, in the province of Massachusetts Bay, in North America," which was passed at the last session of British parliament; a large and populous town, whose trade was their sole subsistence, was deprived of that trade, and involved in utter ruin. Let us for a while suppose the question of right suspended, in order to examine this act on principles of justice: An act of parliament had been passed imposing duties on teas, to be paid in America, against which act the Americans had protested as inauthoritative. The East India company, who till that time had never sent a pound of tea to America on their own account, step forth on that occasion the assertors of parliamentary right, and send hither many ship loads of that obnoxious commodity. The masters of their several vessels, however, on their arrival in America, wisely attended to admonition, and returned with their cargoes. In the province of New England alone the remonstrances of the people were disregarded, and a compliance, after being many days waited for, was flatly refused. Whether in this the master of the vessel was governed by his obstinancy, or his instructions, let those who know, say. There are extraordinary situations which require extraordinary interposition. An exasperated people, who feel that they possess power, are not easily restrained within limits strictly regular. A number of them assembled in the town of Boston, threw the tea into the ocean, and dispersed without doing any other act of violence. If in this they did wrong, they were known and were amenable to the laws of the land, against which it could not be objected that they had ever, in any instance, been obstructed or diverted from their regular course in favour of popular offenders. They should therefore not have been distrusted on this occasion. But that ill fated colony had formerly been bold in their enmities against the house of Stuart, and were now devoted to ruin by that unseen hand which governs the momentous affairs of this great empire. On the partial representations of a few worthless ministerial dependents, whose constant office it has been to keep that government embroiled, and who, by their treacheries, hope to obtain the dignity of the British knighthood, without calling for a party accused, without asking a proof, without attempting a distinction between the guilty and the innocent, the whole of that antient and wealthy town is in a moment reduced from opulence to beggary. Men who had spent their lives in extending the British commerce, who had invested in that place the wealth their honest endeavours had merited, found themselves and their families thrown at once on the world for subsistence by its charities. Not the hundredth part of the inhabitants of that town had been concerned in the act complained of; many of them were in Great Britain and in other parts beyond sea; yet all were involved in one indiscriminate ruin, by a new executive power, unheard of till then, that of a British parliament. A property, of the value of many millions of money, was sacrificed to revenge, not repay, the loss of a few thousands. This is administering justice with a heavy hand indeed! and when is this tempest to be arrested in its course? Two wharfs are to be opened again when his majesty shall think proper. The residue which lined the extensive shores of the bay of Boston are forever interdicted the exercise of commerce. This little exception seems to have been thrown in for no other purpose than that of setting a precedent for investing his majesty with legislative powers. If the pulse of his people shall beat calmly under this experiment, another and another will be tried, till the measure of despotism be filled up. It would be an insult on common sense to pretend that this exception was made in order to restore its commerce to that great town. The trade which cannot be received at two wharfs alone must of necessity be transferred to some other place; to which it will soon be followed by that of the two wharfs. Considered in this light, it would be an insolent and cruel mockery at the annihilation of the town of Boston. By the act for the suppression of riots and tumults in the town of Boston, passed also in the last session of parliament, a murder committed there is, if the governor pleases, to be tried in the court of King's Bench, in the island of Great Britain, by a jury of Middlesex. The witnesses, too, on receipt of such a sum as the governor shall think it reasonable for them to expend, are to enter into recognizance to appear at the trial. This is, in other words, taxing them to the amount of their recognizance, and that amount may be whatever a governor pleases; for who does his majesty think can be prevailed on to cross the Atlantic for the sole purpose of bearing evidence to a fact? His expences are to be borne, indeed, as they shall be estimated by a governor; but who are to feed the wife and children whom he leaves behind, and who have had no other subsistence but his daily labour? Those epidemical disorders, too, so terrible in a foreign climate, is the cure of them to be estimated among the articles of expence, and their danger to be warded off by the almighty power of parliament? And the wretched criminal, if he happen to have offended on the American side, stripped of his privilege of trial by peers of his vicinage, removed from the place where alone full evidence could be obtained, without money, without counsel, without friends, without exculpatory proof, is tried before judges predetermined to condemn. The cowards who would suffer a countryman to be torn from the bowels of their society, in order to be thus offered a sacrifice to parliamentary tyranny, would merit that everlasting infamy now fixed on the authors of the act! A clause for a similar purpose had been introduced into an act, passed in the 12th year of his majesty's reign, intitled "An act for the better securing and preserving his majesty's dockyards, magazines, ships, ammunition, and stores;" against which, as meriting the same censures, the several colonies have already protested. That these are the acts of power, assumed by a body of men, foreign to our constitutions, and unacknowledged by our laws, against which we do, on behalf of the inhabitants of British America, enter this our solemn and determined protest; and we do earnestly entreat his majesty, as yet the only mediatory power between the several states of the British empire, to recommend to his parliament of Great Britain the total revocation of these acts, which, however nugatory they be, may yet prove the cause of further discontents and jealousies among us.